After just signing a deal with Virgin, Bruce talked the label into financing a mini-tour of the USA and Canada before starting work on their first Virgin album. 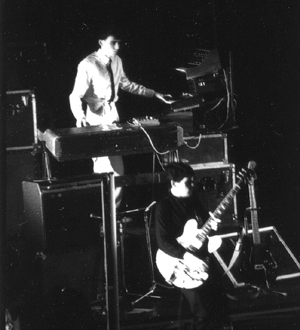 The thinking was sound: seeds had already been sown in Europe, where the band were starting to outgrow their cult status, so it was time to do the same in North America. Surprisingly the label agreed. Of course, celebratory gigs in Glasgow and Paris were a must. Sitting around for two months waiting for Arista to release them had allowed the band some breathing space. New songs such as Sweat In Bullet, Careful In Career and Love Song had been written, and they were tried out for the first time on stage. Traveling the USA gave Jim inspiration for the lyrics of what would become Sons And Fascination: " It was an interesting period in America when we were there: the hostages had just returned from Iran and Reagan had just been elected "
Paul Kerr, Jim's younger brother joined them on the tour for the first time as a roadie. Jim was wary of giving him a full-time job, worried about charges of nepotism. But Paul always pulled his own weight and the band and crew were impressed. However, all was not well. Despairing at being away from home, and fighting nervous exhaustion, Brian's worsening condition caused the tour to be cut short, and the band returned to the studio. 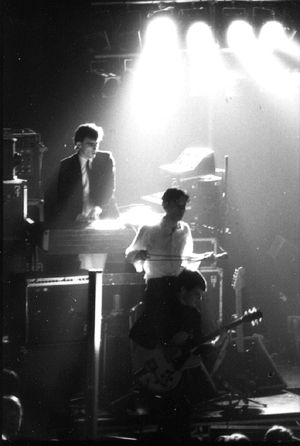 Simon Draper, one of the key persons in the early Virgin Records, saw the band at this gig. This eventually lead to the band being signed to the label. 6 dollars on the door, or 5 dollars if you booked in advance. If the Beacon Arms Hotel sounds small, the band were actually playing the Fyfe & Drum Room inside. Many thanks to Brad for the poster scan. "The Edge. Masonic Temple. Massey Hall. Going all the way up to Maple Leaf Garden arena, and others beyond. 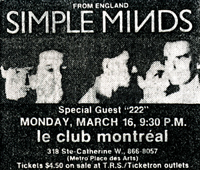 The list of venues that Simple Minds have played in Toronto is long and varied. It is however those first three names that always conjure up some of the greatest nights of our "young lives" - spent during our band's formative years excitedly touring all over Canada, performing in particular in Toronto." "Montreal opened its heart to us very early in our journey, for that we will always be grateful. 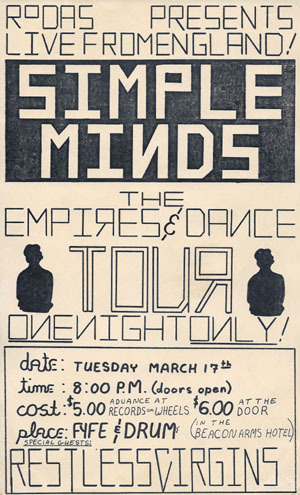 Vancouver was another that encouraged Simple Minds back in those days when we were struggling to make any impact beyond small clubs and college radio stations. Add Ottawa to those names, with Winnipeg to follow, and as you can see, it made sense for us to soon venture out into the real heartlands, gigging in bars and clubs in Edmonton, Calgary, Saskatoon etc." "Touring in a freezing and dilapidated bus, I can tell you it was very cold, and very dark out there, as we made our way gig after gig over long stretches of highways, driving on and on into the next destination. Thankfully though, we were always met with warm receptions wherever we found ourselves on-stage. Mostly red hot in fact. That made every effort worthwhile." 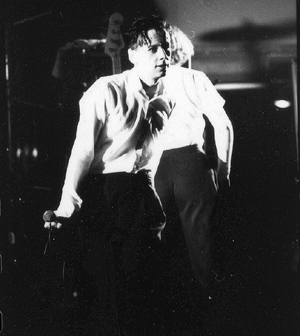 "It was Toronto that truly first started to come out in real numbers to see Simple Minds. Local radio station CFNY began adding us to their regular playlist, exposing the city to our music in a way that no city in the world - apart from Sydney - was then doing. Our thanks still knows no end. But it was the over the top enthusiasm of kids in Toronto (we were all kids back then) that really gave us the wings to fly." "Many of those early Minds supporters became friends, and remain so to this day. I clearly recall carousing Yonge street with them after the gigs had finished, moving on from one bar/party to the next, until sun came up. Then - collapsing exhausted - before getting ready to do it all again the very next day." 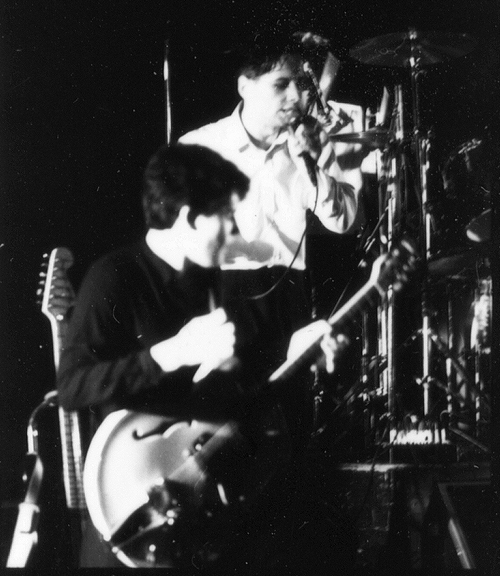 This was Steve Pollard's first gig with the band.